Welcome to Blog #29, and the first Wednesday after Easter. How did you spend Easter? Ours was bookended by social activities – a picnic on Friday and a rather liquid lunch on Monday (recovery yesterday was on the 6-aspirin scale). In between those culinary and social delights, many quality hours were spent in a supine position on the couch, watching TV series’ that I never seem to get to watch when they come on TV. And why is this so? I just never seem to be able to remember when the show is on so I miss crucial plot points and forget who supporting characters are and in general just can’t keep up week by week (it’s that short attention sp… wait – who’s texting me? Ha – it’s Tony – they’re in Melbourne and…. hang on – what was I saying?). So, watching an entire series in one go works for me. Plus, it’s like watching a 10.5hour movie. Sure, there’s some repetition to deal with, but in a show like Damages that’s actually a good thing. Even with that repetition, we still had to pause it from time to time to review what was going on (“no, that’s the sister in law who had the one night stand with the guy who’s working for Ted Danson’s lawyer. Get it now?”). So, this was how Easter Saturday was spent at our place. Watching a 10.5hour movie in the guise of a television show. Damaged? One such show is Damages, starring the chameleon like Glenn Close (how can one woman look striking and stunning one moment and frightening and forbidding the next? It can’t all be makeup and lighting, surely). I can’t watch a movie or TV show without noticing what people are wearing. It’s part of what makes the experience fun, right? And was there a lot to feast your eyes on, in the sartorial department, in Damages! Tiger stripes. 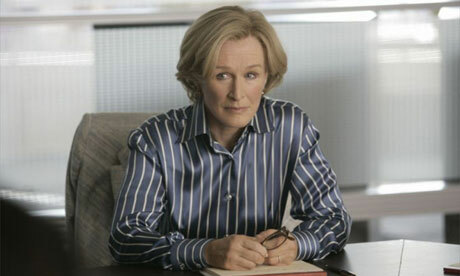 Glenn Close, as the litigation lioness Patty Hewes, wears so many striped business shirts I stopped counting them. Sometimes she wore a striped or checked jacket with the striped shirt. Stripe-on-stripe is a seriously ballsy combination, require a degree of confidence that most of us just aren’t up to. Glenn as Patty pulled it off, though – it worked for her. She oozes authority, it wafts off her body like smoke off a fire. Authority on a hanger? A lot has been written about the perception of authority and why (and how) uniforms are necessary in those contexts where authority must be asserted immediately. Not in 6 seconds time. Now. That has to be the reason why judges wear black robes, right? I mean, what other purpose can the wearing of the robe be serving? In Britain, not only the judges wear the black robes, but the barristers do too — and the horsehair wigs, which are still worn to this day (unchanged from when this attire first came in, in 1660. 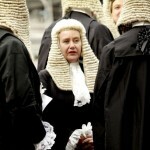 Those wigs, by the way, can cost over one thousand pounds and weigh nearly as much). A judge could be wearing anything under that robe, right? It’s the robe that denotes the authority — he/she could be wearing board shorts and a singlet under it and have as much authority, because of the robe, as if they were wearing a $4000 suit. That’s why what someone wears is linked to how much authority they appear to have. It’s all perception, context, smoke and mirrors. So we’re told. Jerry Lewis in a suit. Does this mean that any village idiot can don a $4000 suit and be considered an authority figure? I don’t think that’s what it means – that’s called all sizzle and no steak, and who wants smoke in their eyes without the meat on their fork? But Authority Dressing still has its place, right? Why else do people wear suits on Very Important Occasions, like job interviews, funerals and parole hearings? Is it because we want as much on our side as possible? We want to stack the deck in our favour – we want to impress, confuse death, convince our PO of our rehabilitated state. And a suit helps. Outback authority. Do you remember how much attention was given when Joanne Lees wore the “cheeky monkey” t-shirt to the first hearing of Peter Falconio’s disappearance in Australia’s Northern Territory in 2001? In her book, No Turning Back, she talked about how stunned she was at the response to what she was wearing, and how off point it seemed to her (I’m paraphrasing, naturally, although the word “off” did appear in her commentary). Those comments had an impact on her, though – during the trial in 2005, she chose her clothing very carefully – a dark skirt, black high heels and a white business shirt. She wore that same outfit every day of the trial, and called it her “uniform”. It was meaningful. Loathsome and hated, but meaningful. She had a ceremony of sorts to get rid of the ‘uniform’ when the trial ended. Probably not a $4000 outfit then. Damages meets Bergdorf Goodman. There’s a scene early on in Season 1 of Damages where the Rose Byrne character, Ellen the junior associate, is sent by Patty’s assistant to Bergdorf Goodmans, the most upmarket department store in New York City. This store is so swanky you practically need a note from the mayor just to get in. If you don’t have your nose in the air, a sneer on your dial and a swagger in your step as you wander around the store, they ask you to leave; if you have to look at the price on the label…. oh, ok you get the idea — it’s a pricey joint. Ellen is told to see the BG in-store shopping advisor, who “knows what Patty likes”. Cut to the dingy 3-room apartment Ellen shares with hunky doctor-in-training fiance, her arms laden with BG shopping bags – she even has to go back outside to get more bags (“wait, there’s more” — true, that line is really in the show). And these bags are full of clothing “that Patty likes”. Putting aside that they didn’t show us the best bit (shots of Ellen shopping! Looking at the price tags! Plus, the bottom line — who paid: Hewes & Associates or did Ellen take out a second mortgage and pick up the tab herself? ), and the possible infringements of Ellen’s civil liberties by being told what to wear… (what am I talking about again? this sentence has gone on so long, with so many (possibly inappropriate) punctuations, that I’m a bit lost…oh, that’s right…) …. What’s intriguing about this is that Patty seriously wants to influence what Ellen wears. Why? It’s gotta be that authority thing again, right? Look like you know what you’re talking about (and are worth a month’s rent in the hourly fee we’re charging for your time) and you’re halfway there. Or 42.97% there, at least. Guilty! No, wait…. is that a Brooks Brothers? The halo effect is when we judge someone to be ‘all good’ or ‘all bad’, based on their physical characteristics. Good looking people are considered to be smart, considerate, capable, etc… because they are attractive. The halo is handed out with the good looks. An extreme version of the halo effect is the eyebrow-raising tidbit of info that handsome men get better results than their ugly male counterparts (one presumes) in criminal and civil cases. Can you believe that? Some say that’s why Ted Bundy got away with murder for so long. Girls liked the way he looked and couldn’t believe a good lookin’ guy like him would do them harm. A cute smile and bell bottoms – an irresistible combo. Guess that means that Patty was right in sending Ellen to Bergdorfs (we’re back to Damages, now. You with me? Just hate it when people’s attention span wanders!) Right?